This software license works only on the computer on which the identification was made. Changing components on your computer (like hard drive or sound card...) is not problematic, but the transfer to another computer is not allowed. You will find it using the file menu. WARNING: this file won't exist until you run the software at least once. The cost of the license for ZeeEdit-FS1R is 42€. You pay via Paypal using the "Buy Now" button. There is no need to register to Paypal if you do not have an account, a card is enough. Send the 'serial' using the contact form (category: "FS1R Serial"). WARNING: Use the same Email address as the one you used for Paypal. If not, specify in your message your name and the date and time of your payment in order to be identified. You will receive a 'license' file by Email. 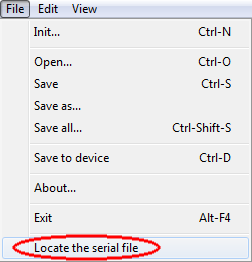 You just need to copy it beside your 'serial' file, in the same directory.